Finger millets or ragi are healthy and fibre rich grains which are very good for the body. Health experts often recommend the use of Finger Millets for breakfast almost everyday. 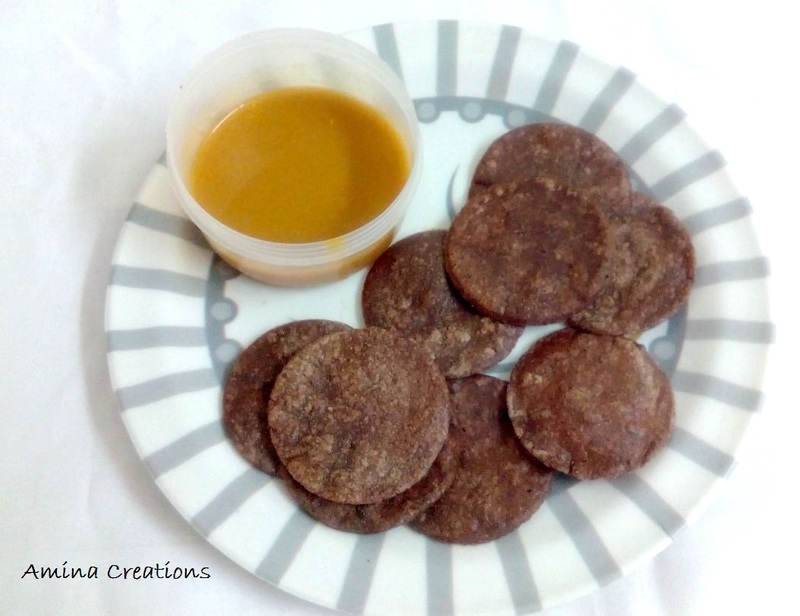 We too have started to include more Ragi based dishes in our diet and I have shared the recipes of Ragi roti, Ragi semiya, Ragi cookies and Ragi laddoos in my earlier posts. My 3 year old daughter is a fussy eater and so to make her eat Ragi/ Finger Millets, I made these small biscuit sized chapathis/rotis with Ragi flour. 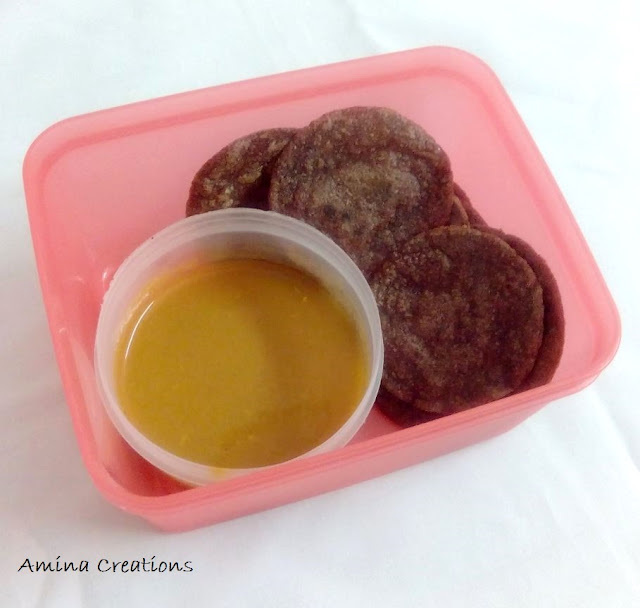 This was an instant hit and my daughter loved eating the mini/bite sized Ragi rotis with Toor dal curry. I also pack it for her school lunch. Boil water in a pan along with salt. When water starts boiling, reduce the heat and add the flour. Allow the dough to cool down a bit and when it is slightly warm sprinkle some water and knead the dough. Ad 2 tbsp oil and knead again to form a smooth dough. Then make small balls, flatten it and set aside. 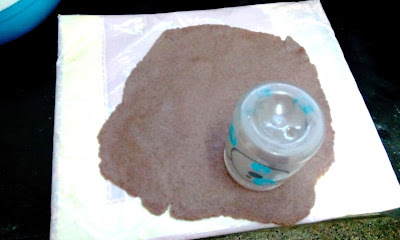 Now take a plastic board (you can also use a clean thick plastic sheet or a plastic chopping board) and use this to roll the dough. (We are using this because the ragi dough is quite sticky and usually sticks to the bottom and to the rolling pin). Grease the surface, your hand and rolling pin with oil. Apply a drop of oil on either sides of the dough ball and roll it into a round shape of about 1/8” thickness. 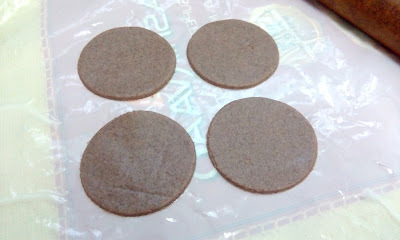 Then take a small circular lid or bottle and place over it such that it cuts the roti into a round shape. 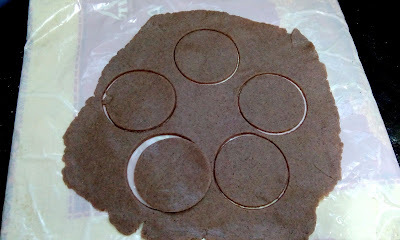 Cut 5 to 6 circles as shown. Put the extra bits back to the dough. Transfer the mini rotis to a pan and cook on one side. Turnover, drizzle some oil (optional), and cook for some time and again turn to the other side. Cook till the roti slightly puffs up or gets dark brown spots on both sides. In this way cook all the other rotis. 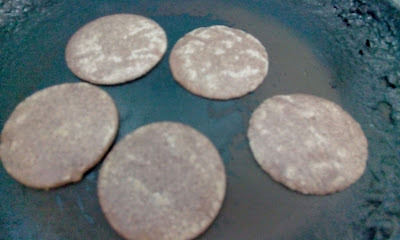 This recipe makes about 45 to 50 mini rotis. You can decrease the quantity of ingredients if you are making for one person. It tastes best with groundnut chutney.